Life without Rosie O’Donnell began on “The View” Tuesday morning as the ladies said their public goodbyes to their former co-host. In Rosie’s place was guest host Whoopi Goldberg, and the women wasted no time getting right to the heart of the matter. While “The View” went on, Rosie spent the weekend boating with her family. And now “Extra” can reveal the exact reason Rosie said goodbye. It was the moment that spelled the end for Rosie, when “The View” showed the two pointing fingers and yelling, side-by-side. Also, believe it or not, Rosie said she sent a note to Elisabeth! Forgive and forget is one thing arch-nemesis Donald Trump just can’t seem to do. He’s even taking full credit for her decision! So what’s next for the embattled comedian? Rosie said she may spend some time on tour with Cyndi Lauper. 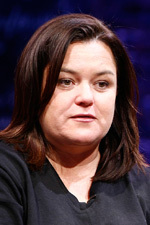 As for “The View,” Barbara Walters wants everyone to know Rosie is missed. “She’s welcome back anytime she wants,” Barbara said on the show.